I am building a stand alone tiled shower. It's a dual curb Corner shower. 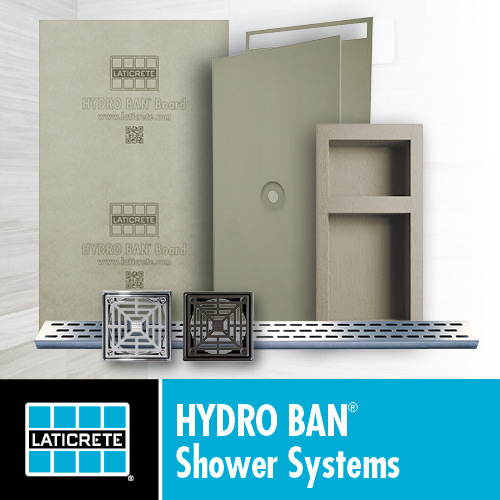 1. building a custom shower base : subfloor-->building paper-->metal lathe-->mortar-->CPE membrane-->mortar-->metal lathe-->mortar or some variation of this. 4. Schulter-Kerdi shower kits... (CAN TILE) Good to great reviews. Can the Schulter-Kerdi 48 x 48 be cut down to 40" x 38" or am i limited to making square cuts on it. How can the foam possibly not give a spongy feeling? I'd combine 1 and 3 and skip the foam receptor base. Surface applied membranes (like Kerdi) make most sense to me. They're expensive and rarely would fit the space in remodel situations. Cutting to size makes edges differing heights unless equal amounts are taken all around perimeter. I can cut parallel lengths off a 39 x 39 prefabricated base to get it to fit. The issue I'm struggling with is my shower space has a column in the corner so it turns the adjacent space into unusable space if I use the Schulter-Kerdi system. See pic upper right corner. Any suggestions on how to make that space usable? It's a 27" x 9" area. Last edited by jgleason; 03-12-2017 at 03:42 PM. Where's your shower head? Valve? I dare say you could do a mortar pan, many beginners have done it successfully. Failing that, pehaps you just use the space in that area to recess a niche or two and keep the floor square. You could put a floating bench in where the ? mark is. That way you still have floor space and shoulder space in a smaller shower. I think Schluter makes foam extensions and if they don't there's other companies that have foam shower base systems that do. Foam (and most other) shower bases are manufactured so that the outside edge is always level all around. Unless you cut equal amounts, one edge(s) will be lower than another. That allows the outer perimeter tiled edge to be perfectly level all around. Other than aesthetics, it has no functional imperative that dictates it must be level, but makes things harder, and some don't like the look (but, if you have a linear shower drain, the edges aren't level anyways). So, you can cut a foam pan to any size you want, but most people prefer to keep the edges level all around, so that takes a custom pan, most easily accomplished with a mudbed. Draw a level line all around, pack a rim of deckmud that is level at that line, then slope it to the drain. Deck mud is like working with wet beach sand that you pack into position. A little tricky, but not really all that hard. IT is heavy, and you don't have forever to work it, but it's not expensive and even if you make a few trial runs, it won't break the bank. Each one will get better and faster. The shower head and valve (knobs right?) will be on the same wall. See updated pic. I could put them on the wall with the unusable space as the pipes wrap around that way if that helps with a design you were envisioning. Any recommended how to's on doing a mortar pan? Last edited by jgleason; 03-12-2017 at 03:41 PM. I believe the bench needs to be inside the wet space. Meaning it has to be inside the Schulter curb. Correct me if I'm wrong. If you're going with a linear drain, then a foam pan would work (although more expensive), since the walls would be sloped to match the pan anyways. Note, Schluter does make a SS trim piece that can make that neater, specifically for use with their linear drain pans. Also, their linear pans come already covered with the membrane, which eliminates a step. They had talked about doing that with their center drain pans, but I've not looked carefully for awhile. A single slope is maybe easier to do than a bowl to a center drain when doing a mudbed - the whole thing is one flat plane. Good point... what are the toughest parts of doing a mudbed. Sounds like the drain location choice will make the job easier for a first timer. The toughest part is getting over the fear of failure. The materials are cheap, learning is priceless. I changed the layout a bit swapping positions of the tub and shower. The tub now sits next to the column. It allows me to install a slightly bigger shower. Last edited by jgleason; 03-19-2017 at 10:48 AM.